On a foray into our backyard recently, I discovered a couple of garden survivors. The marigold above has survived our erratic weather this year. Husband Walter had set out a few marigold plants he bought in the spring along with some veggie plants. 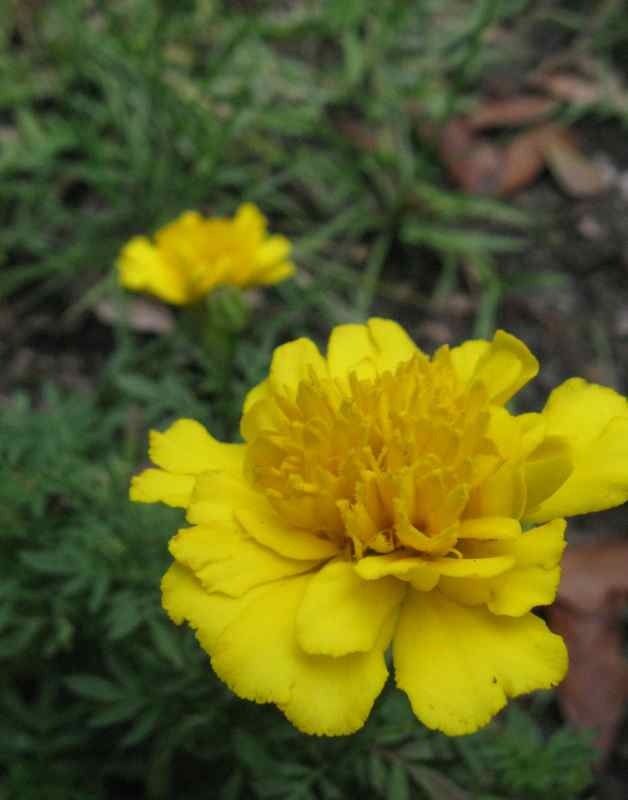 Finding the healthy, blooming marigold was even better than his bringing home a bouquet from the florist. The other survivor was a green onion that was barely hanging on, crowded by weeds in a flower pot. And it was that struggling survivor that bolstered my courage for my first post-stroke gardening attempt the next day. I put my favorite weeding tool, gardening gloves and Osmocote slow-release plant food in a plastic bucket. With my hiking stick in my right hand and bucket in the left, I stopped at the back door, setting the bucket down and beginning strategic maneuvers to get bucket, hiking stick and myself over the threshold and down the step. I found a second flowerpot with several tiny surviving onion bulbs and successfully weeded, fed and watered the baby onions in the two pots. I also realized the gloves were superfluous. I still have a ways to go before I can get gloves on by myself. I hope the onions survive. I could always buy more sets, but the original sets that the babies descended from were pass-alongs from a family friend’s garden decades ago. Before my stroke the onions had survived and multiplied with only occasional watering and sprinkles of Osmocote. That was quite a versatile grenade. I sympathize with that headline writer, though. In my newspaper days most of my deadlines were for news articles and features. But I had also on occasion experienced the daunting task of fitting a subject, active verb and direct object in a one-column headline. Under the pressure of a tight deadline, mental processes do sometimes hiccup. The result can even be a grenade that is cutting grass instead of a man who, while he is cutting weeds in his yard, finds a grenade. I’ve been there, done that, and am too embarrassed to wear the T-shirt. An intriguing new word for me is “proprioceptors”—nerves in the skin that sense where our body parts are in space. At least that was a definition in the Parade magazine insert in a recent edition of our local newspaper. Early in my stroke recovery I was alerted that stroke survivors commonly are not able to tell where their bodies are in their environment. My personal experience confirmed that. I do not automatically sense where my shoulder is in relationship to a door jamb, for example, or where one body part is in relationship to another of my body parts. I have to be careful not to sit on my left hand or get my foot wedged at a potentially injurious angle between table leg and chair. But this was the first time I had encountered a specific word that helped me understand how undamaged bodies gather information and transmit it to the brain for use in maintaining balance and accomplishing simple and complex movement. I was enthralled and plunged into a Google search. I found that proprioceptors are also in muscles and joints as well as skin. The process of gathering information and transmitting it is “proprioception.” Inoperative proprioceptors on my left side evidently are the reason I must develop new cues using sight, sound or even a touch of the fingertips of my right hand on a wall, chairback or some other solid object, to add other points of reference for the proprioception process. One of the sources I read also noted that proprioception is the reason most people can walk in the dark. My ability to do that is non-existent now. Our bodies are truly amazing, miraculous, and for me, a joyful reminder of the Master Designer’s work. Proprioceptors -- who knew? My 2-1/2 year old grandson would have said, "What that mean?" Lol. Proprioception. That explains much. I reach for something and miss it. I wondered what was going on. Grenades. Heck of a way to mow a lawn. Thanks for sharing with us all of your research on proprioceptors. That is all very fascinating and confirms much of what my vestibular therapist has told me. She said that the exercises I was taught would help my brain reestablish some of those lost sensitivities that would also allow me to more accurately assess where I was in relationship to my environment. It is all very fascinating stuff. Thankfully I am getting better, and thankfully, you are getting better too. Your stroke left you with much more to recover than I had to recover, but reading of your journey gives me so much insight and knowledge. God bless. I've been reading your interesting posts to catch up on your stroke recovery process. I congratulate you for your positive attitude, perseverance, sense of humor, ongoing learning efforts, independent skills practice, and more. Hope you give yourself credit for the gains you've made because you clearly evidence an approach to recovery therapists would like everyone they work with to have. Your smile is great! Looks like your exercises did much to eliminate any facial droop and glad your speech is clear. You've chronicled well so many of the feelings, thoughts, function frustrations many stroke patients experience, as some have explained to me and I've observed. Your family and friends support is really wonderful. Science and rehab therapists have learned that recovery from stroke can continue just as you demonstrate, unlike what was once believed. I think your blog posts could be a good source for other stroke patients with similar problems to read. so could be a good referral to them, and/or their family members, who have Internet connections and want to enter the blogosphere. Your motivation, change of physical condition that includes gains, certainly helps your therapists justify to insurance company case managers and doctors why you should continue receiving therapy -- or resume, if you've taken a break from it. When people choose insurance they often don't know how much or how little therapy their policy will potentially provide since most of us rarely think about needing it. You might be interested in the American Heart Assoc. which publishes a Stroke magazine in which they often print stories individual's write about having had strokes. I know from my mother's personal stroke experience how difficult coping with balance problems can be -- no longer receiving the signals to keep her from falling if she leaned too far backward. Also, a family friend who lived to be 103 had balance problems in her final years, though hers may have been caused by problems other than stroke. Still, they both continued to live independently, but each had to use a walker and neither ever fell. Now, some P.T. depts. have a unit that changes position that people stand on that is appropriate therapy for some types of balance issues -- likely your P.T.s know if that's appropriate for you. Just wanted to add my words of encouragement to you.